Eden Hazard runs rampage on Hungary. 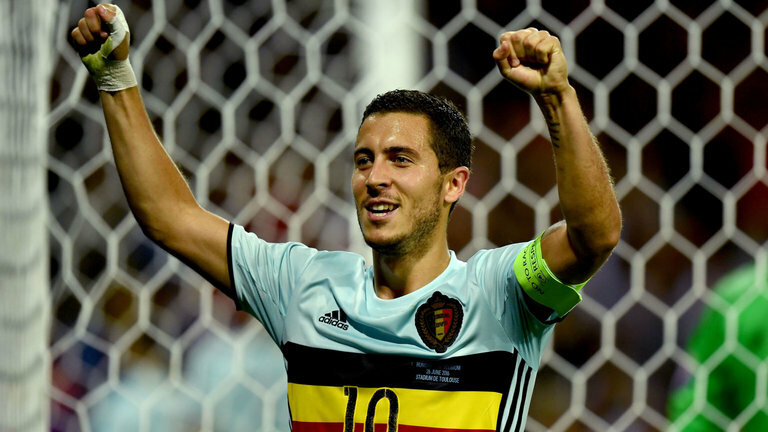 Eden has finally shook off all frustrations in the Belgian national team and thundered Belgium to a 4-0 victory with a masterclass performance. Sensational, Exceptional, World Class. The headlines were certain: Warning Hazard! This Hazard was unstoppable. 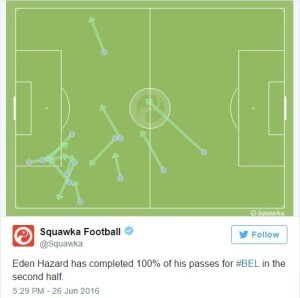 Hazard dribbled everyone and hardly lost a ball. See his remarkable statistics. It has to be said, Hungary gave the Belgian team a lot of space to play football. 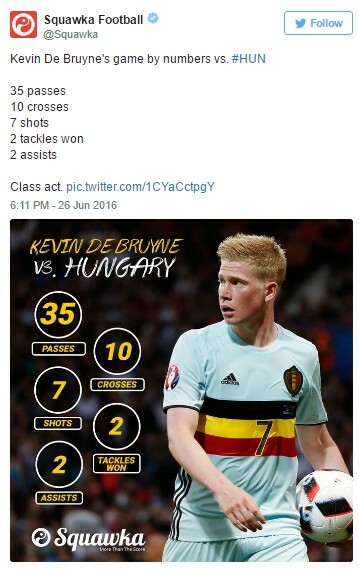 And Wilmots finally saw the light keeping De Bruyne on the nr. 10 spot and leaving useless Fellaini on the bench. 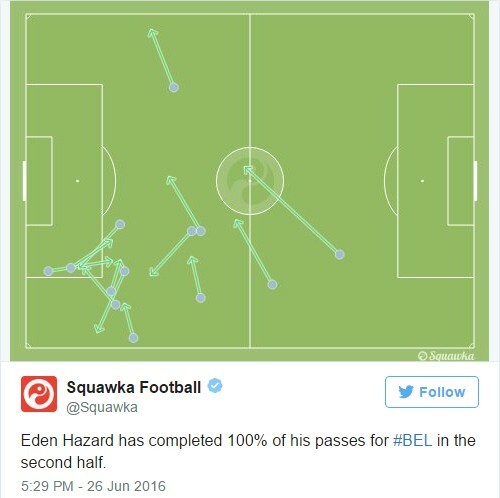 Belgium cán and must produce fast, technical, accurate and vertical passing style of football. Belgium had chance after chance but failed to convert it into goals. 18 chances, and 1 goal. In the first half Kevin De Bruyne and Hazard took the team to a higher level. In the second half Hazard had finally pressed his button “awesomeness” and outplayed everyone else on the field: dribbles, sharp counters, an assist and a magnificent goal on counter attack. Belgium’s captain Hazard is being celebrated by Nainggolan and team members. 100% passing score in the second half. 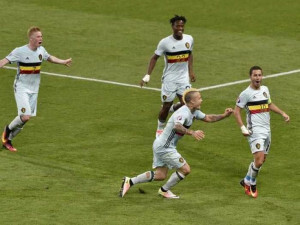 The reasons why Belgium couldn’t finish the games are simple: Hazard should have moved into the attack next to Lukaku. Lukaku himself had a good day but failed creating an end product. Wilmots waited too long to replace him Batshuayi to form a deadly counterattack with Carrasco and De Bruyne behind them. Mertens also had an off-day, besides his generally positive but inefficient display. 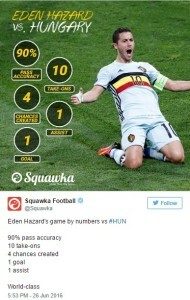 Hazard was chosen Man Of The Match by UEFA and whoscored.com. Lots of euphoria in the Belgian press, but the next opponent is Wales which is a different kind of opponent. The team will not give any space at all, and hope for the usual Bale-moment. Belgium will have score twice in order not to end up with a draw from a Bale-free kick. Wilmots on the other hand should finally opt for 2 attackers: Hazard and Lukaku where Lukaku is much more efficient in the second half, and Batshuayi and Origi and much better in combinations. There is no point in having Hazard dribble 5 players 10 meters from the box, when he can dribble 2 and create a penalty in the box. Once Wilmots realizes he has to put his player in form as close to the goal as possible, Belgium has a real chance to make it to the final.